Dairy that was in Wilson Avenue. Referred to in this 5th January 1962 article from the Mitcham News & Mercury on the death of local dairyman. RETIRED dairyman Mr. Arthur Court (aged 69), Victoria Road, Mitcham, who died suddenly last week, was a well-known local personality. He went into the dairy business after leaving school at Killick’s Lane — now St. Mark’s Road — and could remember driving cows to graze on Figges Marsh when he was only 10. He celebrated his golden wedding with his 70-year-old wife in February. During the First World War he served in the Royal Flying Corps as a cook. After, he took over Bordergate Dairy at Wilson Avenue, Mitcham. Among his eight grandchildren were Tommy Court, a Kingstonian footballer, David Court, who is with Arsenal, and Elizabeth West of Mitcham Athletic Club. Probate record on Ancestry shows his death was on 27th December 1961, and he lived at 141 Victoria Road. He left £2,702 7s. to his widow. This entry was posted in Agriculture, People, Roads, Sport and tagged 1962, Figges Marsh, St Marks Road, Victoria Road, Wilson Avenue on March 29, 2019 by Mitcham Historian. Damaged steering failed to prevent three men from completing the dangerous mountain circuit of the Monte Carlo rally. Danger spot for the enthusiasts was in the mountains. They hit a boulder which had fallen into the road. The Zephyr came through the course almost unscratched. “Apart from lamps which were smashed by falling stones we had little trouble. We spun round once or twice, but somehow always ended up pointing in the right direction. Conditions were pretty good, although we did experience a bit of everything including fog and ice,” said Mr Sproxton. He returned home on Sunday. On Monday he was back behind the counter of his shop. For photo, see Merton Memories. This entry was posted in People, Sport and tagged 1959, Home Radio, London Road on January 30, 2019 by Mitcham Historian. LIEUT.-COL STEPHEN CHART, a member of Mitcham Cricket Club for 50 years, was elected club president at the annual meeting. He succeeds Mr. H. L. Gauntlett, who died last year. During the rest of the election of officers it was mainly a case of the old bands carrying on. Reelected were E. J. Dobinson (chairman). J. H. Stainforth (secretary), S. J. Pillinger (treasurer) — for the 27th year — and B. Bullock (match secretary). Team captains are E. J. Ide (1st XI), G. Brodie (2nd XI), T. W. instance (3rd XI) and S. L. Smith (Wednesday XI). F. Cole is team secretary. Surprise of the elections was the appointment of the opening bowler, R. S. Culmer, as vice-captain to the first team. At the previous annual meeting Culmer had said he would not be playing regular cricket. He forecast a gradual retirement from the game, Presumably he will now appear more frequently. Collections on the Green during the season amounted to £218 with a further £178 from the loan of deck chairs. But the rising costs of the game are still hitting the club and a campaign to recruit honorary members is being launched. Each member of the club will try to enrol two. The Harwood Trust bat – awarded to the most improved player under 25 – went to 18-year-old Colin Morgan, the opening batsman who had an average of 62 during cricket week. This entry was posted in Clubs, People, Sport and tagged 1954, Harwood, Mitcham Cricket Club, Stephen Chart on December 19, 2018 by Mitcham Historian. Cricketer who made 82 appearances in first class matches in the 19th century. 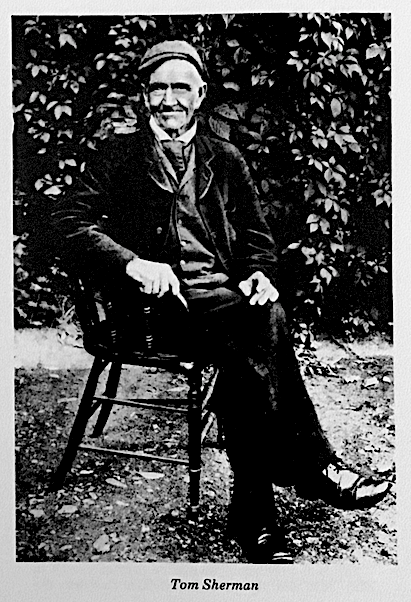 Born in Mitcham on 1st December 1825, his father James Sherman was also a cricketer. He died 10th October 1911. I thought it would be of interest for you and others interested in cricket to know that Mr Tom Sherman attains his seventy-ninth birthday to-morrow. He is the oldest Surrey cricketer, and has the unique distinction of having played continuously for fifty years. His health haring quite failed him, and circumstances for this reason being anything but comfortable, I would be glad if something might be done to make his position a little more comfortable during the winter months. I feel quite sure that some of the older generation who knew him in his famous bowling days would willingly help him if they knew his position. His obituary was reported in the Croydon Guardian and Surrey County Gazette of Saturday 14th October 1911. TOM SHERMAN DIES AT CROYDON. The death of Tom Sherman, of Mitcham, who succumbed at Croydon Hospital, Tuesday, after breaking his leg at Mitcham, leaves William Caffyn the only survivor of a great band of professional cricketers who were in their prime nearly sixty years ago. In “Scores and Biographies,” Sherman, who was born 1827, is described the as the fastest bowler of his time, and himself recalled the fact that in one of Surrey matches against Yorkshire at Sheffield he broke stump into five pieces. For this feat an admirer gave him a case of razors. Sherman played for Surrey during eleven or twelve seasons with Julius Caesar, Caffyn, Lockyer, Martingell, and Mortlock. Sherman never bowled against Dr. W. G. Grace, but the man for whom he had the greatest respect as a bat was Fuller Pilch. Sherman dropped out of county cricket when his county were at their best, taking scarcely any part in the great things achieved by the Surrey team under Mr. F. P. Miller, who led the side to victory against All England in 1861. Appearing at Lords in 1846, Sherman met with most success in season the of 1850 and 1851, taking 99 wickets in the course of ten matches during two years. This was before bowling analyses were taken. Described as one of the fastest round-arm bowlers, he earned fame as a contemporary of Alfred Mynn, Fuller Pilch, George Parr, William Caffyn, Felix, and Martingeil. Two months older than Caffyn, Sherman was the oldest professional cricketer living. This entry was posted in People, Roads, Sport and tagged 1904, 1911, Carlton Gardens, cricket, Lower Green on November 12, 2018 by Mitcham Historian. Laburnum Park was the name used for the housing development on the former Mitcham Stadium site. It may have been the name given by Wates Ltd, the developers, who bought the site in 1955. Norwood News, 15th May, 1959, via the British Newspaper Archives. MITCHAM, Laburnum Park Estate – Two-year old luxury, modern, terrace house, three bdrms., bthrm., open plan downstairs, central heating, Marley floor, large kit., garage; £3,300 freehold – Box N0790, News, Upper Norwood. Norwood News, 29th April, 1960, via the British Newspaper Archives. Members of the Laburnum Park Estate Residents’ Association, Mitcham, presented one of their neighbours – England and Surrey Cricketer Ken Barrington – with a golf trolley at a dance held in his honour at the White Hart Hotel, Mitcham, on Friday. Pictured with Ken, who recently returned from the West Indies with the M.C.C., are officials of the association and Tooting and Mitcham players Brian Bennett, Paddy Hasty and Ted Murphy, who were among the guests. This entry was posted in People, Roads, Sport and tagged 1956, 1959, 1960, Brian Bennett, Fowler Road, Guyatt Gardens, Ken Barrington, Mitcham Stadium, Ormerod Gardens, Paddy Hasty, Priestley Road, Roper Way, Ted Murphy, Tooting and Mitcham United FC on October 16, 2018 by Mitcham Historian. Sports stadium, which occupied around 8 acres, north of Eastfields Road and opposite the football ground in Sandy Lane, was built in 1935 and was sold to property developer Wates Ltd in 1955. 1953 aerial photo showing football and rugby posts on the field. Fernlea Road is on the left, with Sandy lane at the top. the user of this land for the purpose under the provisions of the Town Planning Scheme. Resolved, That Mr. Parkes be informed that no objection will be offered by the Council. A detailed history of the stadium can be found at the Gandermonium blog. 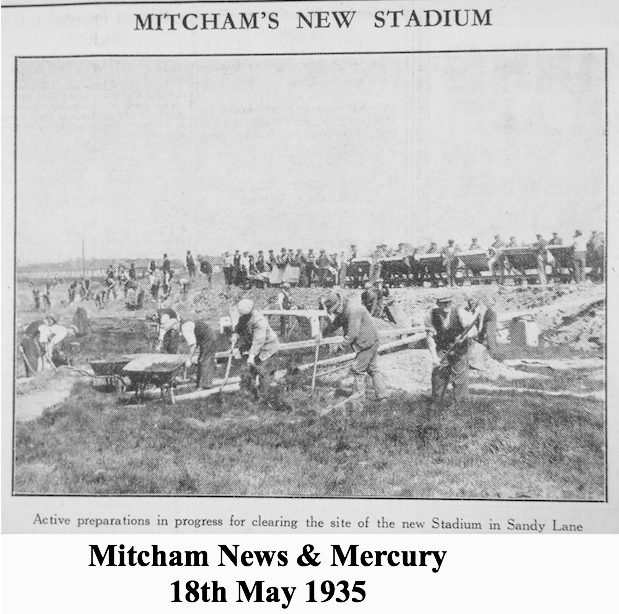 Norwood News, 6th September 1935, showing construction of one of the two stands. 300 tons of steel was used in each stand, and by comparison, the Majestic cinema had 350 tons. Norwood News, 6th September 1935 advertising the opening of the stadium the next day. In addition to rugby, Irish games such as hurling were played at the stadium. The site was sold to Wates Ltd who built housing with Guyatt Gardens, Ormerod Gardens, Fowler Road, Priestley Road with Roper Way connecting to Eastfields Road. 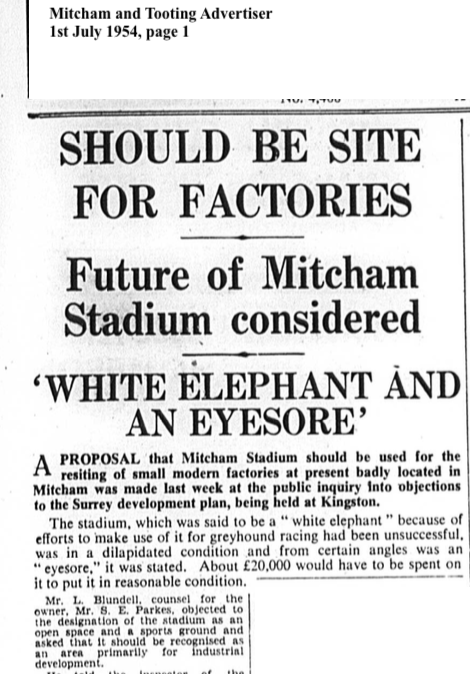 Mitcham and Tooting Advertiser, 26th May 1955, page 1. 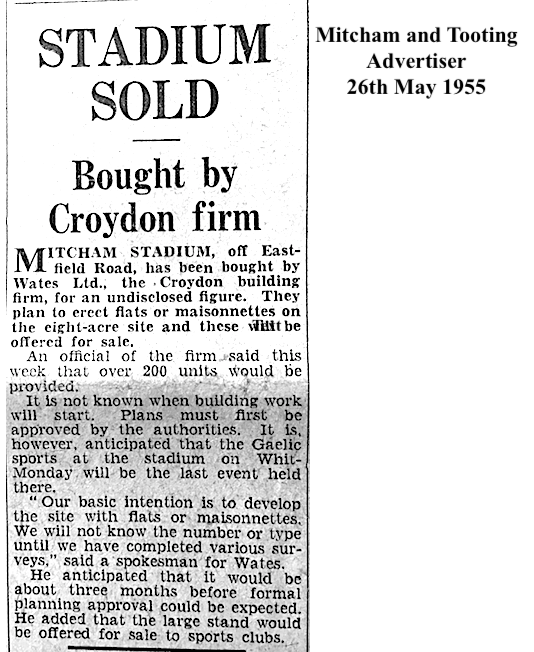 House for sale ad in 1965 referred to the former Mitcham Stadium. This entry was posted in Buildings, Roads, Sport and tagged 1935, 1938, 1953, 1954, 1955, 1965, Eastfields Road, Fernlea Road, Fowler Road, Guyatt Gardens, Mitcham Stadium, Ormerod Gardens, Priestley Road, Roper Way, Sandy Lane, Wates Ltd on October 13, 2018 by Mitcham Historian. Football club, Mount Road and area. MOUNT Rovers F.C. have decided in future the players’ shorts and socks will he provided by the Club to improve smartness on the field. There are still one or two vacancies for good class players to join the club, whose first eleven is in the Premier Division of the Morden and District Sunday League. The Reserve XI is the only second-strmg team to be placed as high as the first division of the same league. 7, Mount Road, Mitcham, Surrey. At Mount Rovers annual meeting at the Bath Tavern, Mitcham, the officers were elected as follows: Mr A. Hanney, chairman; Mr H. Mount, secretary; Mr A. Brier, assistant secretary; Mr E. R. Mount, treasurer. Three teams will be put out next season, all competing in the Morden and District Sunday League. A letter was read from the president (Mr G. Arnold) stating that he intended to award annually a trophy to the player or official whom by secret vote was deemed to be outstanding. The secretary H. Mount suggested that a committee be formed to cater for any increase of membership that might arise in view of the area in which their football ground was situated (Phipps Bridge) being redeveloped. This was agreed. This entry was posted in Clubs, Pubs, Roads, Sport and tagged 1960, 1962, Bath Tavern, football, Harry Mount, Mount, Mount Road, Phipps Bridge on August 16, 2018 by Mitcham Historian.